A set of caps with hatched Egyptian top and decorated Tuscan bottom halves, c. 1850. Revived by Fonderie Typographique Française as Romantiques No. 5 . Shown in the Solotype catalog as Bracelet . Mecanorma’s version was named Tuscan Ornate . Digital interpretations include Bracelet Victorian (Douglas Day, 2001. “Scanned from Tschichold’s Treasury of Alphabets and Lettering (Norton)”) , JFRingmaster (Jessica Slater, 2001, clean and regularized), Romantiques (Dieter Steffmann, 2002, rough; used for sample), and Egyptienne Zierinitialen (Dieter Steffmann, 2002, different and w/o numerals). Main Strike (FontMesa, 2003) adds a lowercase. 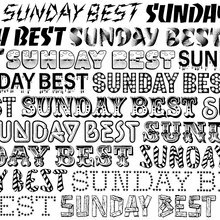 Dusty Circus (Baseline Fonts, 2011) is a layered interpretation.